Click here to try out EditR! 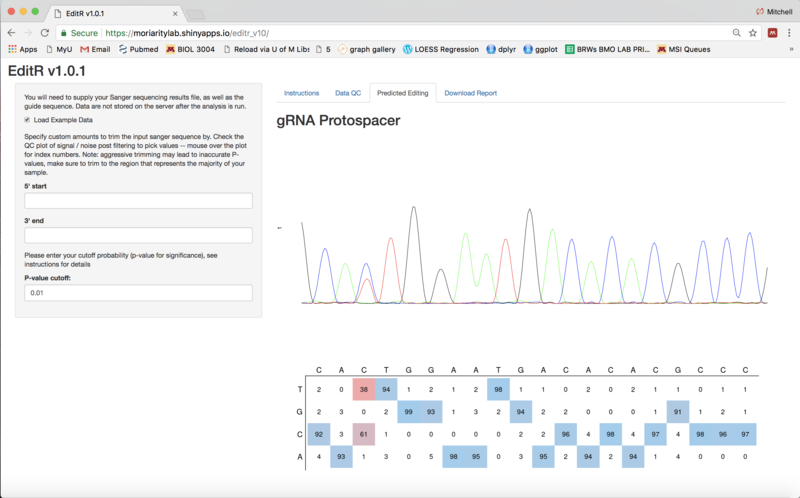 EditR is an algorithm for predicting potential editing in a guide RNA region from a single Sanger sequencing run. This allows users to estimate base editing efficiency quicker and cheaper than using deep sequencing. It consists of the algorithm implemented in the R statistical programming language and provided as a Shiny app built to make this algorithm easy to use. If this software helps you – please cite us and spread the word! Kluesner M, Nedveck D, Lahr W, Moriarity B. EditR: A method to quantify base editing via Sanger sequencing. The CRISPR Journal. 2018. You can use the R Shiny App in two ways: through and instance on shinyapps.io, or installing it locally on your computer. We recommend testing it out on shinyapps.io, and then installing it locally to do a lot of analysis with. If there are issues with R, R Studio, installing R packages, or Shiny, please search for the error in your search engine of choice. This project is maintained by MoriarityLab. Email our group with any questions.